Burns Gasoline to cook large quantities of food quickly. Put various ingredients in this to make soups, stews, and dyes. The Industrial Cooker is an advanced version of the Cooking Pot. It can be used to create food items and dyes but not custom recipes. The Industrial Cooker can be lit by placing Gasoline into its inventory and activated by pressing the 'Use' button (e, , ). 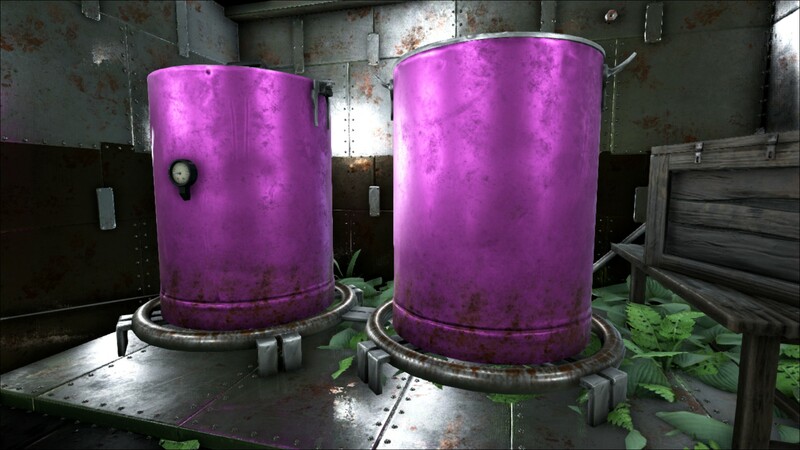 Holding the 'Use' button will open the radial menu, where the player can choose to open its' inventory, light it, or destroy it. 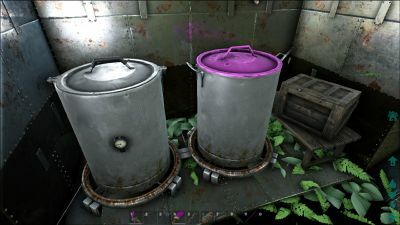 The cooker is used to craft Food Items, Kibble, Soap and all different colors of Dyes. 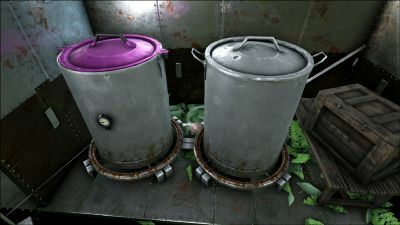 After putting the necessary ingredients into the cooker, including Gasoline and a Waterskin, Water Jar or Canteen that is at least 25% full, light the fire using the button below its inventory slots to cook the food. It is a bit of a nightmare to place the Industrial Cooker with a connection to an existing irrigation system. Unlike electrical devices, which connect automatically with a (not so) flexible cord to the next outlet, the cooker sadly doesn't have a flexible hose. It only snaps to the ends of the pipes. 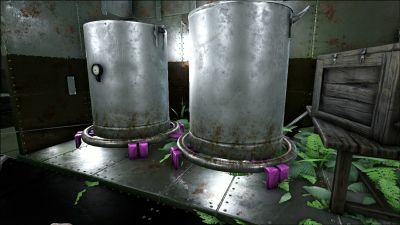 Prior to 227.0, the Industrial Cooker could not be irrigated and required players to actively refill water containers during the cooking process. The Cooker will process 1 kibble every 3 seconds. 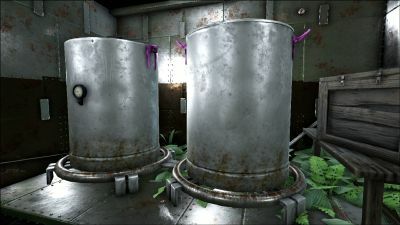 The Industrial Cooker is able to store items unrelated to cooking. 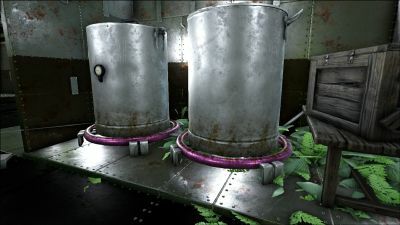 The Industrial Cooker will not pull water from Reservoirs for cooking, since it is also considered a water tank. 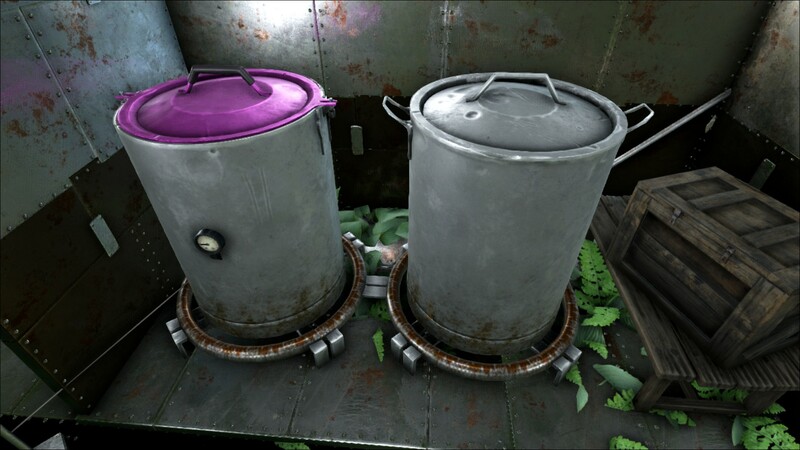 As of patch 250.0 the Industrial Cooker will no longer use a full canteen an unlimited number of times to provide water. This was a popular bug used by players to get around running a long irrigation network. This tool calculates maximum yield when crafting.